Biryani is one of the most popular dishes in India and abroad. Festivals and feasts are complete only when a plate of piping hot Mutton biryani is served with Khatte baingan, chicken 65 and onion raita. 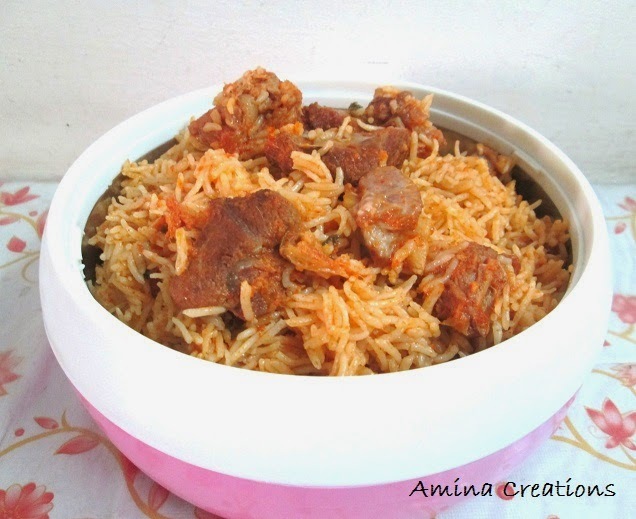 This is my mother's Mutton biryani recipe and the biryani tastes fantastic. Wash and soak the Basmati rice in water for about 10 minutes. To prepare the Biryani kurma, take a pressure cooker and heat oil. Add cardamoms, cinnamons, cloves and the sliced onion, and sauté for some time. When the onions turn golden, add garlic paste, ginger paste and mix well. Then add red chilli powder, tomato puree and salt. Then add curd, coriander and mint leaves and the chicken pieces. Mix well. Finally add 3 cups of water and close the lid. Pressure cook for about 15 minutes. Meanwhile on another burner, place a large pan and fill it with water till 3/4th its volume. Add salt and bring the water to a boil. When water starts boiling, add rice and cook till it is half cooked. Drain the excess water and keep the rice ready. By this time the Biryani khurma would have been cooked. Add lemon juice and green chillies to the khurma and again switch On the gas. Bring it to a boil, then reduce heat and add the half cooked rice to it. Do not mix. Close the lid and pressure cook in medium flame for 5 to 7 minutes. Once done, mix well and serve hot. yummy dish. Biriyani is my fav and love to have mutton the most but never tried preparing by myself. The recipe u have shared is simple and easy to cook i guess. Will prepare once for sure. Thank u for the share. dreamy dish. Very tasty. I have made this. After going through the recipe. 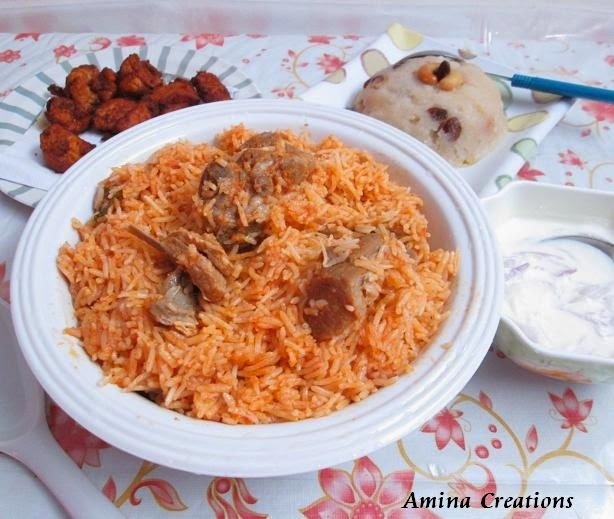 If u want know different tasty biryani visit http://lekhafoods.com/india/biryani/hyderabadi-biryani.aspx. After trying our recipe comment your feedback with good response.